Prominent & Leading Exporter from Ahmedabad, we offer turmeric oleoresin. Our domain expertise has enabled us to come up with an impeccable range of Turmeric Oleoresin. These products are the deep brownish-orange viscous oily fluids, pasty semisolids or hard amorphous solids, Our range is generally yellow solutions containing 15-20% curcuminoids and nil to 10% volatile oil. 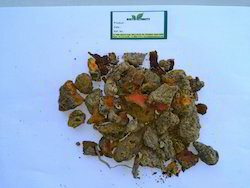 Product Use: used as natural food color, Pharmaceutical Use. Looking for Turmeric Oleoresin ?